The Battle of Qurna, (December 3, 1914) was between British forces and Ottoman forces that tried to retake the city of Basra which they lost at the Battle of Basra (1914) during the Mesopotamian campaign of World War I. By capturing Basra, the British had taken an important communications and industrial centre. The Ottoman's decided that it was vital to their war effort to recapture the city. The British moved most of their men back to Fao because they were short of men and they had decided that Basra was not that strategically important. After the defeat at Basra, the Ottomans decided to take up a defensive position at the small town of Qurna to the south. Since both the Tigris and Euphrates join together at Qurna, it made for an ideal position to make a stand since the British would have to cross the two rivers. The Ottomans marched south from Kut, with an army of 17000 men. The British had an army of 6000 men in Basra. Instead of defending Basra itself, the British marched out to block the Ottoman's path to Qurna. By the time the majority of the Ottoman army arrived at Qurna, the British had already dug earthworks and trenches along the outskirts of the town. In due course reinforcements from Basra were brought up, boosting the British presence outside Qurna to approximately 2,100 troops along with 16 guns. This preceded a second attempt to cross the river on 6 December, again without success. 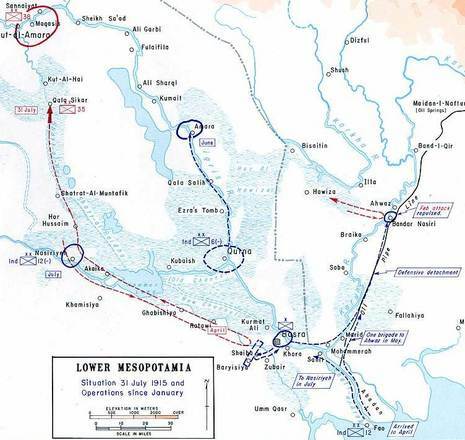 The British changed tack two days later, crossing the Tigris several kilometres from Qurna itself, and planned to attack the town from the rear at dawn while the Turks were occupied by British gunboat fire.